Memorable because: our third kind kiwi! We were setting off to do the Great Lakes Trail, this time with luggage as we would camp half way around. We made our regular stop at the local bike barn for tweaks and changes and encountered our third member of what is now known as the ‘kind kiwi’ series. (First being ice cream money man and second, Phil, our lift to Taupo.) Ashton helped us with our issues, Alice’s chain and my disobedient bike computer. He then raised our seats, pumped our tires and was all round friendly. We were in there for a good hour. We then went around the corner to a cafe to grab a cake and use the wifi before setting off. 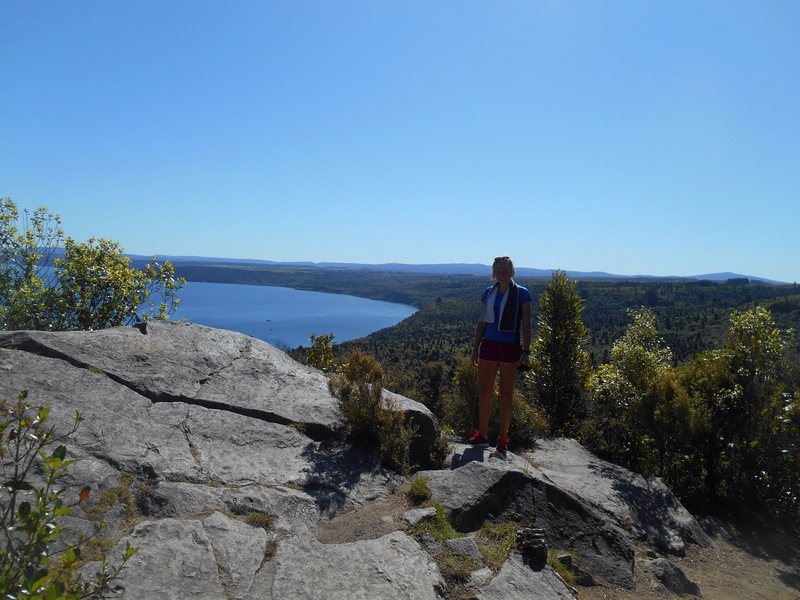 We were also discussing which one of us saw him first and how great it would be to live in Taupo when he came around the corner, obviously collecting his lunch and said if we wanted back past he would give us some free electrolytes. We got to take a selection of all the ones they could no longer sell and he waved us on our way. 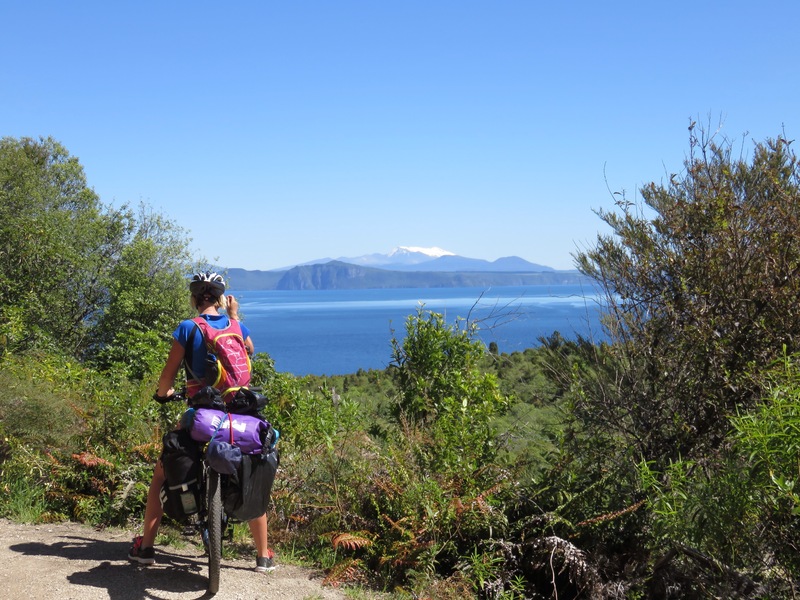 The first climb out of the town gave an amazing view over the Lake and the snow capped Mt Ruapehu on the other side. It was a hilly 26kms to Whangamata (fung-mat-ar) road to start the trail. The china mans track was the first section. Great fun although challenging with luggage. We had a few stops to attach extra bungies and the laden bike did throw me off a few times, however it was great to rumble along. Where that track met the K2K track we were lake side and the glances of brilliant blue through the trees were amazing. 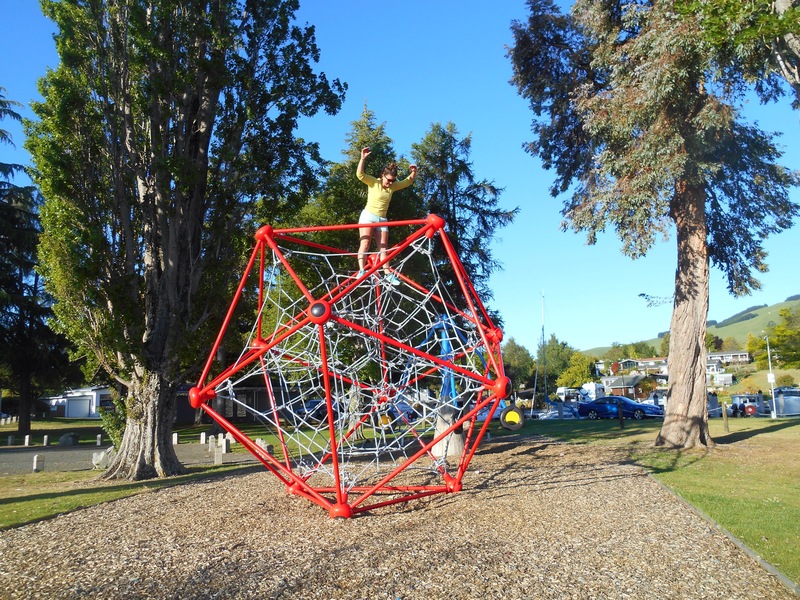 We pulled up in Kinloch at 5pm for a huge ice cream and play on the playground, before we set up camp for the night in the domain. Everyone in the town knew each other and everyone must have owned a boat in the little harbour. The warm evening and the gentle lapping of the waters edge made this an amazing little spot for the night. Challenge: sore butts, stiff backs and achy legs! We packed up early after a cold night and made our way on the steep of the W2K track to Whakaipo Bay. Our stiff muscles groaned as we climbed to the headlands but it was worth the view and the descent! The track took us about 2 hours and we were expecting a town or settlement at the end of it. This is something we are being slow to learn so far in New Zealand, just because a place has a name on a map, doesn’t make it a somewhere. 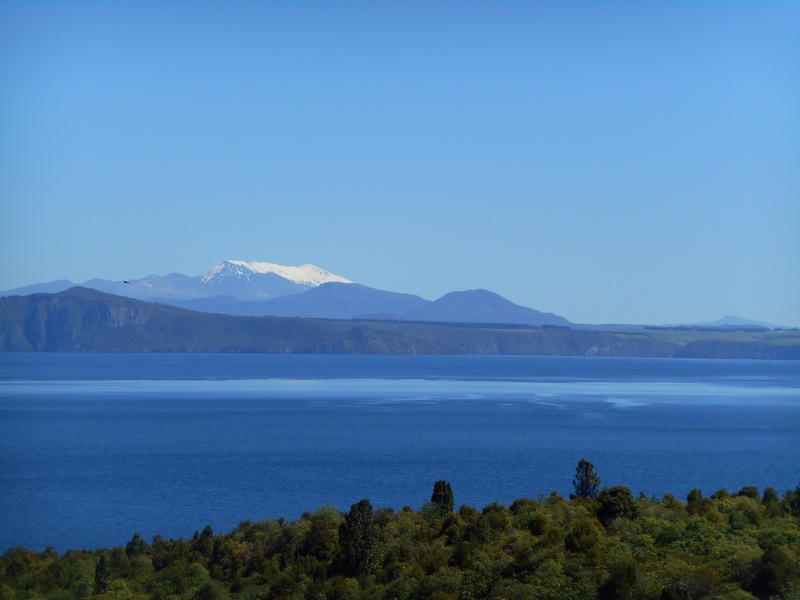 We rejoined the road back to Taupo and were back in town for the Saturday morning markets. Of course, you know, brownie was consumed, then lunch, then we parked ourselves in the sunshine in the park to wait for our bus. We took the coach to Napier, sad to leave behind us the gorgeous centre of the north island. On the way the road was closed due to an accident, but we made good time and got to the coast early evening. 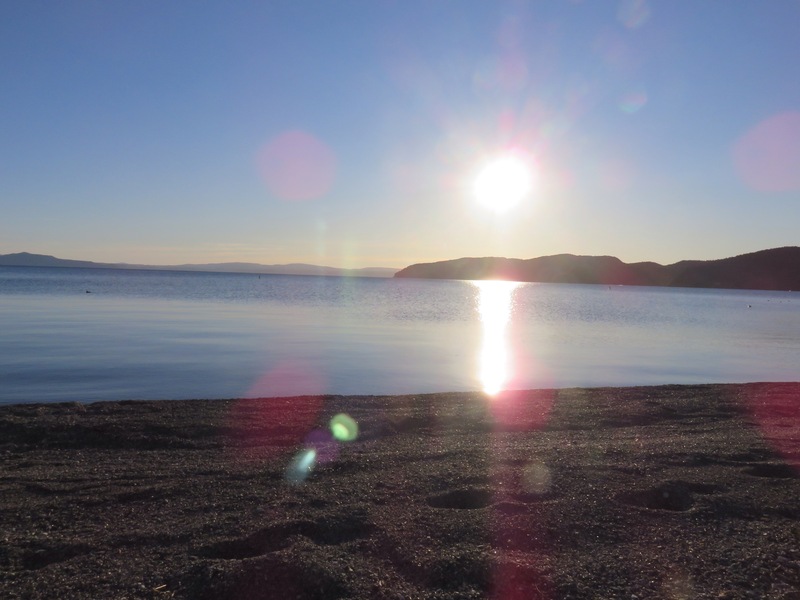 We camped on the seaside, a free spot which was popular with campers and vans. Our ‘next door neighbour’ noticed our bikes and came over to speak to us. He was a polish man sailing around the world and was fascinated with our story as we were with his. Many people have struck up conversation with us over our laden bikes and shared the adventures of their friends and loved ones – it has been a great conversation starter! We were treated to several fireworks displays surrounding us as we ate our dinner, a strange reminder of the Fireworks weekend displays which would be happening back home and the contrast between our sunny days and the days drawing in in the UK. Napier was covered by a sea fog when we got up, so thick we couldn’t see the sea despite being only metres from it. We abandoned the tent and walked around town. 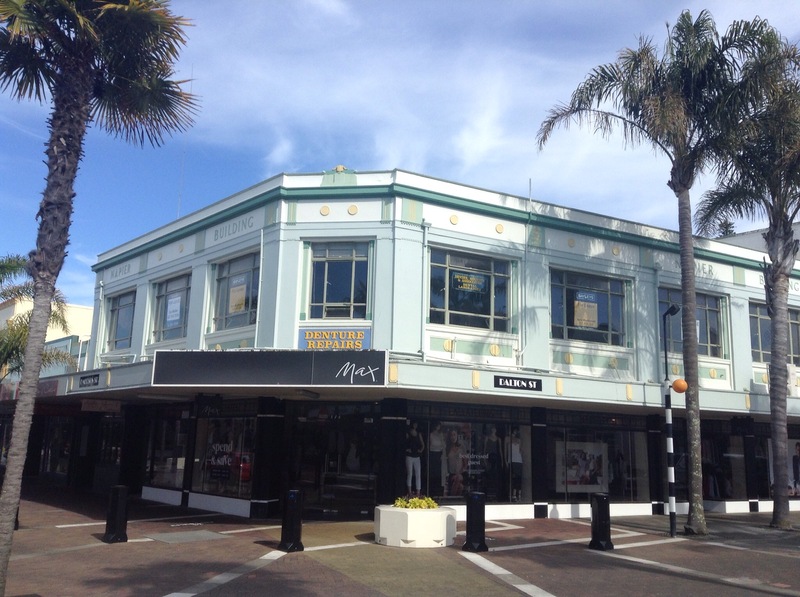 Napier is known for its Art Deco style after being rebuilt post 1931 earthquake. It is now frozen in time as a beautiful tourist town and embraces old fashioned road signs and references to the Great Gatsby and swinging 30’s. 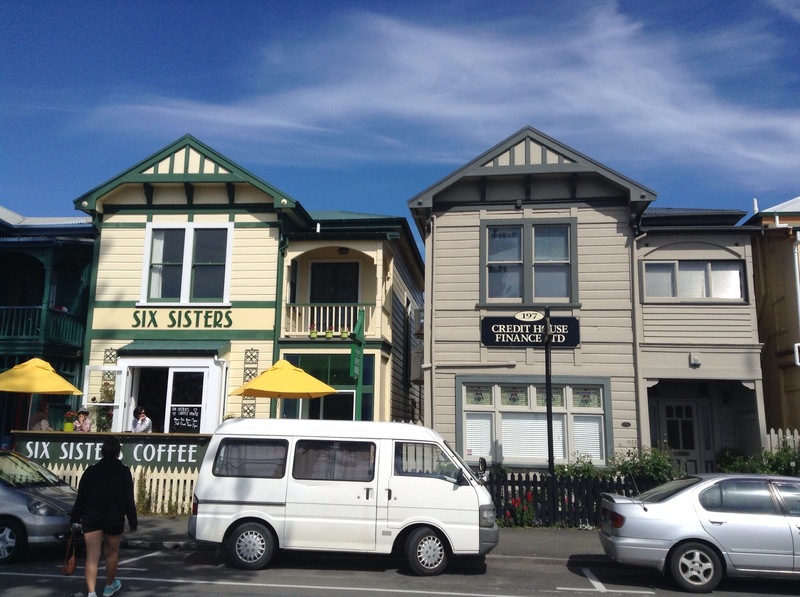 In order to make a plan for the next few days, we had coffee in one of the six sisters, six remaining houses on the waterfront. 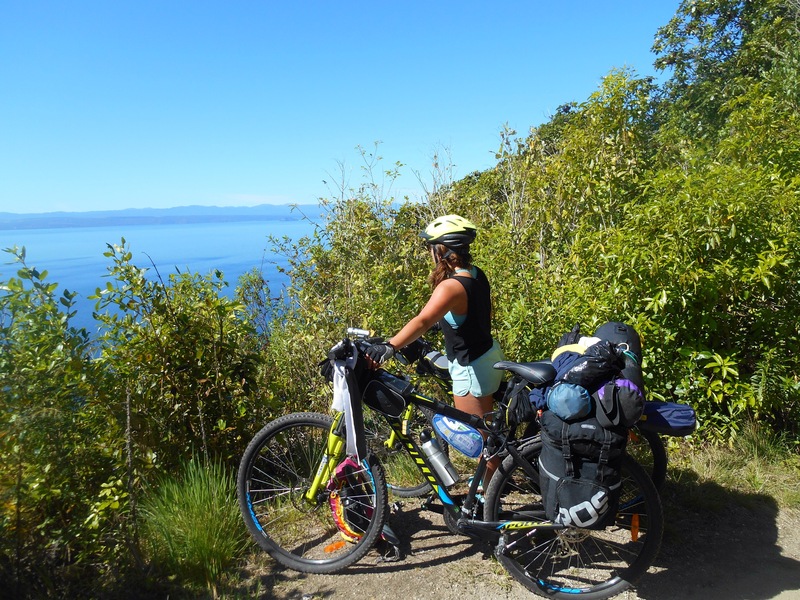 We packed down our tent and followed the coast along a trail to Te Awange which was an easy and flat ride. On the way we encountered lots of cyclists (including one with a dog seat!) 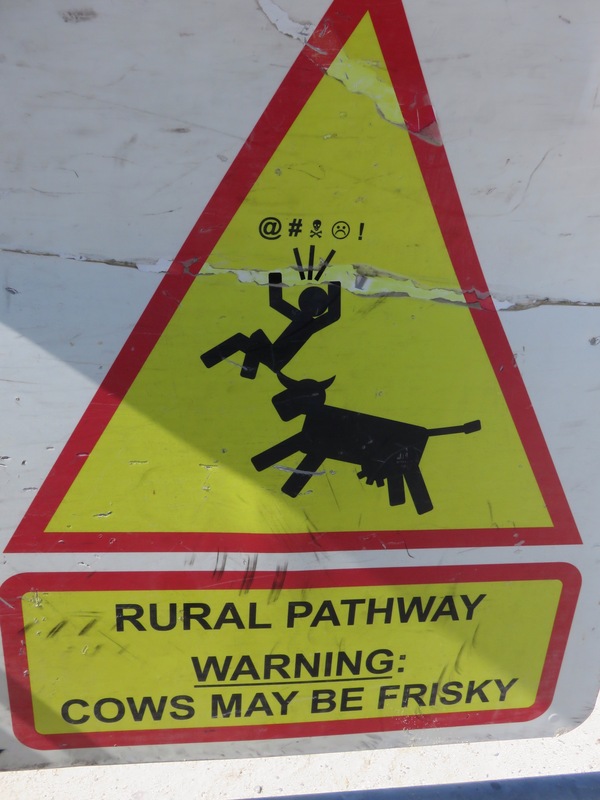 and many livestock gates designed to wear out anyone stupid enough to be touring. After one gate to many I began thinking of how I would like to punish the gates designer, by making everything in his house 2 inches smaller, the twits style. Slim down doors, lower tables, everything just not quite big enough. We had lunch in a small town called Haumoana. I wasn’t expecting much from somewhere who’s library opens once a week on a Tuesday- 10am til 2pm, but the lunchtime rush hour at the dairy and fish and chip shop was fairly impressive. At Te Awange we set up camp, showered and put on laundry. As we had to wash everything we owned, we both spent the afternoon in random attire, Alice in cut of jeans, a bikini top and rain mac. We walked to Clifton, the end of the road, looking out to Cape kidnappers and the lively waves of the coast. In the morning kitchen buzz I spoke to a few other campers, mostly backpackers waiting for the fruit season to begin. 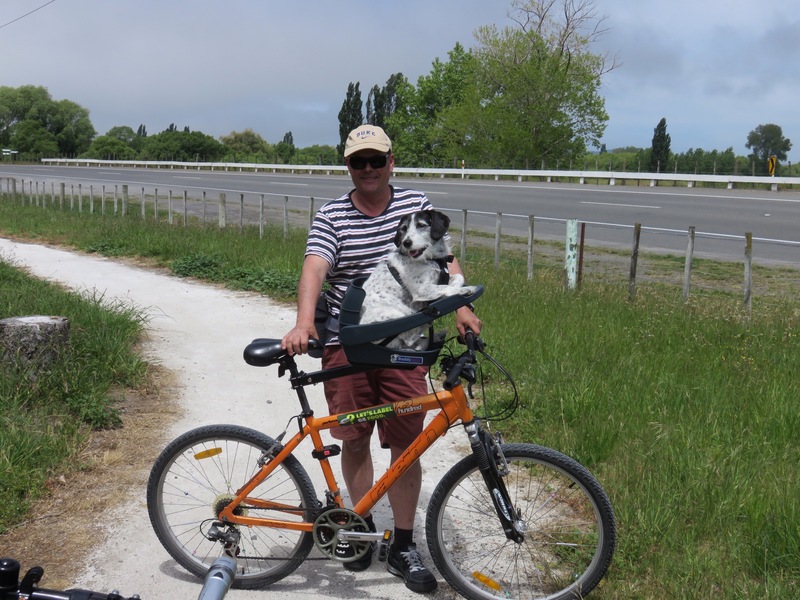 Our French neighbours shared which me their coffee whilst we dismantled our tent and we were on our way, retracing our steps from the day before, then cutting inland to Havelock North. Now in winery region we were passing rows of grapes. We stopped at a cheese cellar and tasted some of the local produce before pressing on to Havelock North and Hastings. Both also kept the feel of the 30’s, HN quaint in its shops, Hastings, a more bustling town. We kicked on to bike the wineries on the town perimeter and stopped at Ash Ridge. The lively hostess introduced each wine, also giving us several sidelines about wind turbines and catching us a secator bug to show us what was noisily showing off nearby. We had lunch and wine before completing the loop. Whilst in Whangarei a lovely couple had given us their address while in their neighbourhood we made contact. They lived close by and we took a cake to pop by. Their hospitality was incredible as they showed us to a big double bed to spend the night and began cooking us a vegetarian feast of risotto and salad, followed by strawberries and chocolate. It was a lovely relaxing evening with yet more kind kiwis! More stunning photos. The blue of the water is beautiful. I like the dog seat on the bicycle. Perhaps I could have something similar when Millie is too old to run. I did think that.. Do you think she would sit still enough?